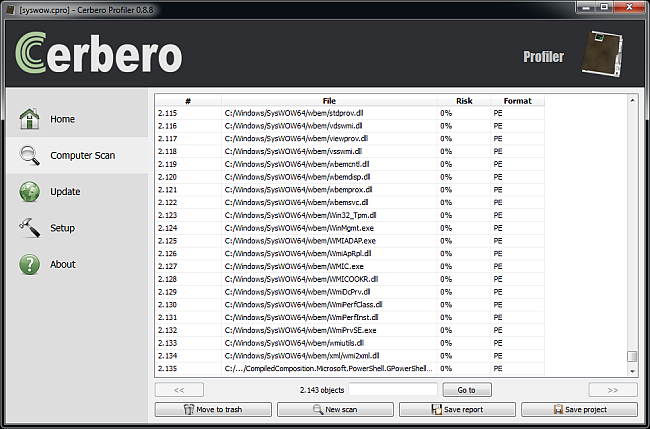 The upcoming 0.8.8 version of the Profiler features a new way of generating reports. 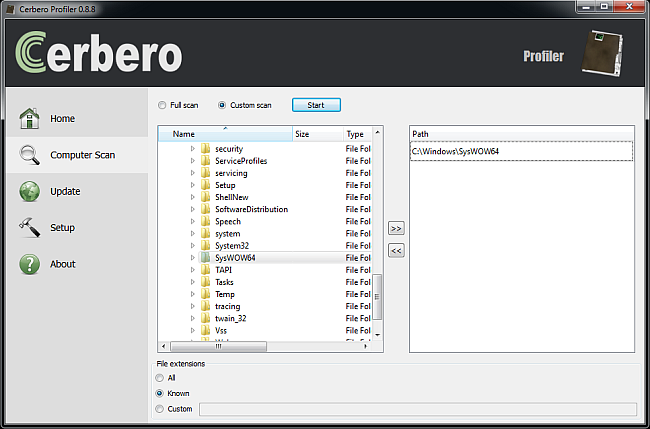 In particular it will be possible to scan multiple files and save a single report for all of them. Moreover, the report can contain the original files (either plain or compressed and/or encrypted). But let’s proceed in order. While it is certainly easy to use the new features, reading this article will help you understanding of the under the hood details. Let’s begin with a custom scan of the SysWOW64 directory. When the scan has finished, we get the list of scanned files. At this point we can click on “Save report”. 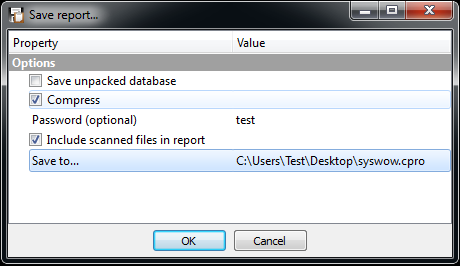 In the options above I decided to include all files in the saved project and use the password “test” to encrypt them. This comes handy if we want to move our analysis to another system or send it to a colleague. What we also can do is to save the unpacked database files instead of the project. This will create a directory with the extension “cprodb” containing two files. A main.db and an objects.sqlite file. Both are SQLite databases: main.db contains all kinds of information while objects.sqlite is reserved to store data about scanned files. Plugins will have access to main.db to store their own data (to be documented in some future post), keeping in mind that tables which begin their name with “pro” are reserved for internal use. When a report is saved, not as a project, but in its unpacked state, it can be saved back to a project by clicking “Save project”. If no project is associated with the report, the user will be asked to select an existing project. Unpacked reports are modified directly and don’t need to be saved. Most of the work for this feature went into testing database technologies suitable to contain a large number of elements and to stress-test them. In the end I decided to implement an abstract interface so that in the future other kind of databases can be added and the user will be in the position to decide whether he prefers to use SQLite or some other database to store information of the scanned files. However, even by using the current SQLite implementation there should be no problem in generating reports with tens of millions of scanned files. I personally did tests up to 100 million of entries. 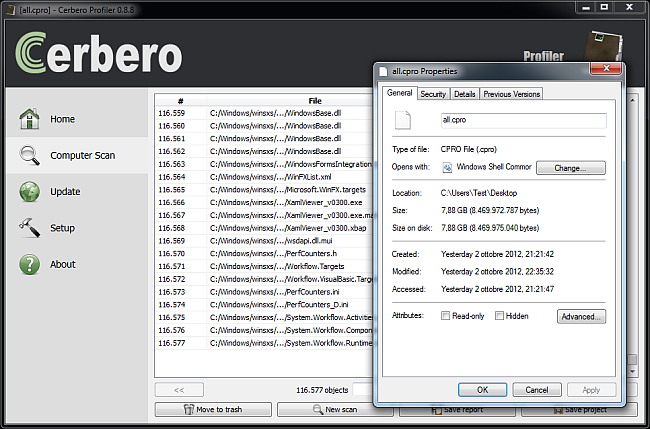 Here’s a screenshot with a saved report of an entire Virtual Machine: the project includes all of the files. The new reporting technology is going to enable other important features (soon to be documented). Please be patient, because it will still take some more weeks to deliver the 0.8.8 version, which will include other significant improvements and features.